Dinner is over. The dishwasher is humming. Cookies are baked. The refrigerator is stocked. Beds are ready. And I eagerly await the arrival of our Minneapolis kids and grandkids – a total of seven offspring. It’s all I can do to stop myself from scanning the driveway, even though I know it’s far to early to see headlights shining and car doors opening. But it won’t be long! The occasion – my birthday. After last year’s grand 60th celebration this is back to normal, but it’s a thrill to know the troops are gathering none the less. My daughter and son have promised to make my birthday dinner, so Rich is off the hook and I look forward to their culinary prowess. My project since Christmas has been to replace the twin beds in the back bedroom with an arrangement that accommodates twice the numbers. We didn’t have enough foresight in planning our retirement home to realize just how rapidly our family members would multiply. To rectify the situation, we turned to our now retired home contractor. With a little arm twisting, and a lot of measuring and planning, he built us a custom set of double bunk beds that perfectly fit the available space. They are the sturdiest, most space efficient sleepers ever. Outfitted with European-style duvets to minimize the pain of making up those upper bunks, they are ready for their first occupants. 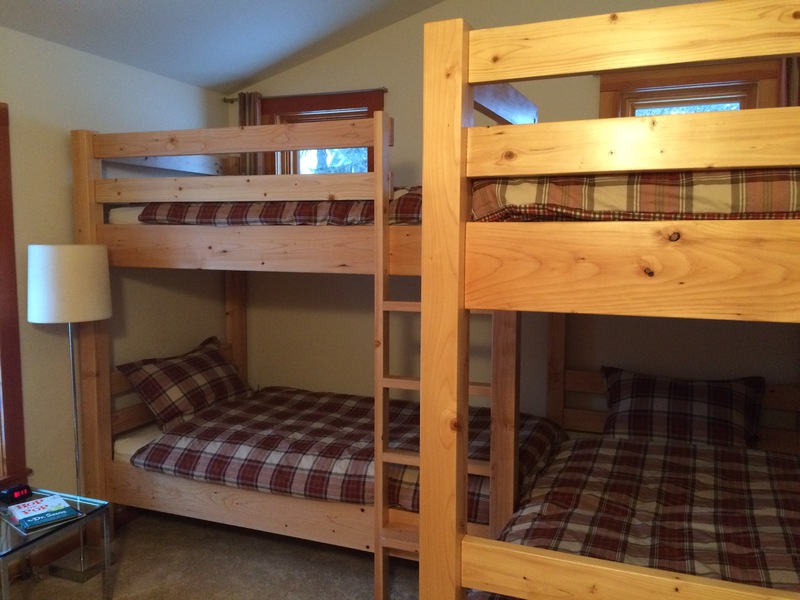 Word has it, the two older grandkids (5 and almost-4) have dibsed the top bunks already.